Brisbane ( i/ˈbrɪzbən/) is the capital of and most populous city in the Australian state of Queensland, and the third most populous city in Australia. Brisbane's metropolitan area has a population of 2.3 million, and the South East Queensland region, centred on Brisbane, encompasses a population of more than 3.4 million. The Brisbane central business district stands on the original European settlement and is situated inside a bend of the Brisbane River, about 15 kilometres (9 miles) from its mouth at Moreton Bay. The metropolitan area extends in all directions along the floodplain of the Brisbane River Valley between Moreton Bay and the Great Dividing Range, sprawling across several of Australia's most populous local government areas (LGAs), most centrally the City of Brisbane, which is by far the most populous LGA in the nation. The demonym of Brisbane is Brisbanite. One of the oldest cities in Australia, Brisbane was founded upon the ancient homelands of the indigenous Turrbal and Jagera peoples. Named after the Brisbane River on which it is located – which in turn was named after Scotsman Sir Thomas Brisbane, the Governor of New South Wales from 1821 to 1825 – the area was chosen as a place for secondary offenders from the Sydney Colony. A penal settlement was founded in 1824 at Redcliffe, 28 kilometres (17 mi) north of the central business district, but was soon abandoned and moved to North Quay in 1825, opening to free settlement in 1842. 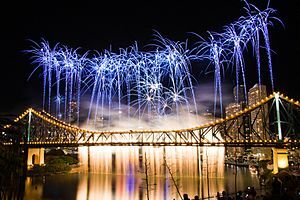 The city was marred by the Australian frontier wars between 1843 and 1855, and development was partly set back by the Great Fire of Brisbane, and the Great Brisbane Flood. Brisbane was chosen as the capital when Queensland was proclaimed a separate colony from New South Wales in 1859. 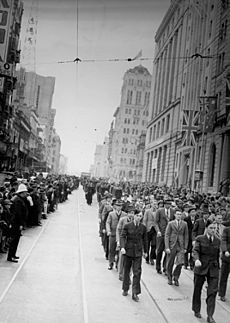 During World War II, Brisbane played a central role in the Allied campaign and served as the South West Pacific headquarters for United States Army General Douglas MacArthur. Today, Brisbane is well known for its distinct Queenslander architecture which forms much of the city's built heritage. It also receives attention for its damaging flood events, most notably in 1974 and 2011. The city is a popular tourist destination, serving as a gateway to the state of Queensland, particularly to the Gold Coast and the Sunshine Coast, popular resort areas immediately south and north of Brisbane, respectively. Several large cultural, international and sporting events have been held at Brisbane, including the 1982 Commonwealth Games, World Expo '88, the final Goodwill Games in 2001, and the 2014 G-20 summit. Prior to white settlement, the Brisbane area was inhabited by the Turrbal and Jagera people. They knew the area that is now the central business district as Mian-jin, meaning "place shaped as a spike". The Moreton Bay area was initially explored by Matthew Flinders. On 17 July 1799, Flinders landed at what is now known as Woody Point, which he named "Red Cliff Point" after the red-coloured cliffs visible from the bay. In 1823 Governor of New South Wales Sir Thomas Brisbane instructed that a new northern penal settlement be developed, and an exploration party led by John Oxley further explored Moreton Bay. Oxley discovered, named, and explored the Brisbane River as far as Goodna, 20 kilometres (12 mi) upstream from the Brisbane central business district. Oxley recommended Red Cliff Point for the new colony, reporting that ships could land at any tide and easily get close to the shore. The party settled in Redcliffe on 13 September 1824, under the command of Lieutenant Henry Miller with 14 soldiers (some with wives and children) and 29 convicts. However, this settlement was abandoned after a year and the colony was moved to a site on the Brisbane River now known as North Quay, 28 km (17 mi) south, which offered a more reliable water supply. Sir Thomas Brisbane visited the settlement and travelled 28 miles up the Brisbane River in December 1824, bestowing upon Brisbane the distinction of being the only Australian capital city set foot upon by its namesake. Chief Justice Forbes gave the new settlement the name of Edenglassie before it was named Brisbane. Non-convict European settlement of the Brisbane region commenced in 1838. German missionaries settled at Zions Hill, Nundah as early as 1837, five years before Brisbane was officially declared a free settlement. The band consisted of ministers Christopher Eipper (1813–1894) and Carl Wilhelm Schmidt and lay missionaries Haussmann, Johann Gottried Wagner, Niquet, Hartenstein, Zillman, Franz, Rode, Doege and Schneider. They were allocated 260 hectares and set about establishing the mission, which became known as the German Station. Later in the 1860s many German immigrants from the Uckermark region in Prussia as well as other German regions settled in the Bethania- Beenleigh and Darling Downs areas. These immigrants were selected and assisted through immigration programs established by John Dunmore Lang and Johann Christian Heussler and were offered free passage, good wages and selections of land. Over twenty small municipalities and shires were amalgamated in 1925 to form the City of Brisbane, governed by the Brisbane City Council. 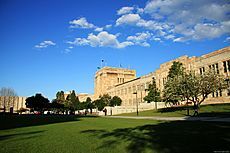 1930 was a significant year for Brisbane with the completion of Brisbane City Hall, then the city's tallest building and the Shrine of Remembrance, in ANZAC Square, which has become Brisbane's main war memorial. These historic buildings, along with the Story Bridge which opened in 1940, are key landmarks that help define the architectural character of the city. Postwar Brisbane had developed a "big country town" stigma, an image the city's politicians and marketers were very keen to remove. In the late 1950s an anonymous poet known as The Brisbane Bard generated much attention on the city which helped shake this stigma. Despite steady growth, Brisbane's development was punctuated by infrastructure problems. The State government under Joh Bjelke-Petersen began a major program of change and urban renewal, beginning with the central business district and inner suburbs. Trams in Brisbane were a popular mode of public transport until the network was closed in 1969, leaving Melbourne as the last Australian city to operate a tram network until recently. Brisbane hosted the 1982 Commonwealth Games and the 1988 World Exposition (known locally as World Expo 88). These events were accompanied by a scale of public expenditure, construction and development not previously seen in the state of Queensland. Brisbane's population growth has exceeded the national average every year since 1990 at an average rate of around 2.2% per year. After two decades of record population growth, Brisbane was hit again by a major flood in January 2011. The Brisbane River did not reach the same height as the previous 1974 flood but still caused extensive damage and disruption to the city. The city of Brisbane is hilly. The urban area, including the central business district, are partially elevated by spurs of the Herbert Taylor Range, such as the summit of Mount Coot-tha, reaching up to 300 metres (980 ft) and the smaller Enoggera Hill. Other prominent rises in Brisbane are Mount Gravatt and nearby Toohey Mountain. Mount Petrie at 170 m (560 ft) and the lower rises of Highgate Hill, Mount Ommaney, Stephens Mountain and Whites Hill are dotted across the city. Also, on the west, are the higher Mount Glorious, (680 m), and Mount Nebo (550 m). The Brisbane central business district (CBD) lies in a curve of the Brisbane river. The CBD covers 2.2 km2 (0.8 sq mi) and is walkable. Central streets are named after members of the royal family. Queen Street is Brisbane's traditional main street. Streets named after female members (Adelaide, Alice, Ann, Charlotte, Elizabeth, Margaret, Mary) run parallel to Queen Street and Queen Street Mall (named in honour of Queen Victoria) and at right angles to streets named after male members (Albert, Edward, George, William). The city has retained some heritage buildings dating back to the 1820s. The Old Windmill, in Wickham Park, built by convict labour in 1824, is the oldest surviving building in Brisbane. The Old Windmill was originally used for the grinding of grain and a punishment for the convicts who manually operated the grinding mill. The Old Windmill tower's other significant claim to fame, largely ignored, is that the first television signals in the southern hemisphere were transmitted from it by experimenters in April 1934—long before TV commenced in most places. These experimental TV broadcasts continued until World War II. The Old Commissariat Store, on William Street, built by convict labour in 1828, was originally used partly as a grainhouse, has also been a hostel for immigrants and used for the storage of records. Built with Brisbane tuff from the nearby Kangaroo Point Cliffs and sandstone from a quarry near today's Albion Park Racecourse, it is now the home of the Royal Historical Society of Brisbane. It contains a museum and can also be hired for small functions. Greater Brisbane had a density of 140 people per square kilometre in 2013. 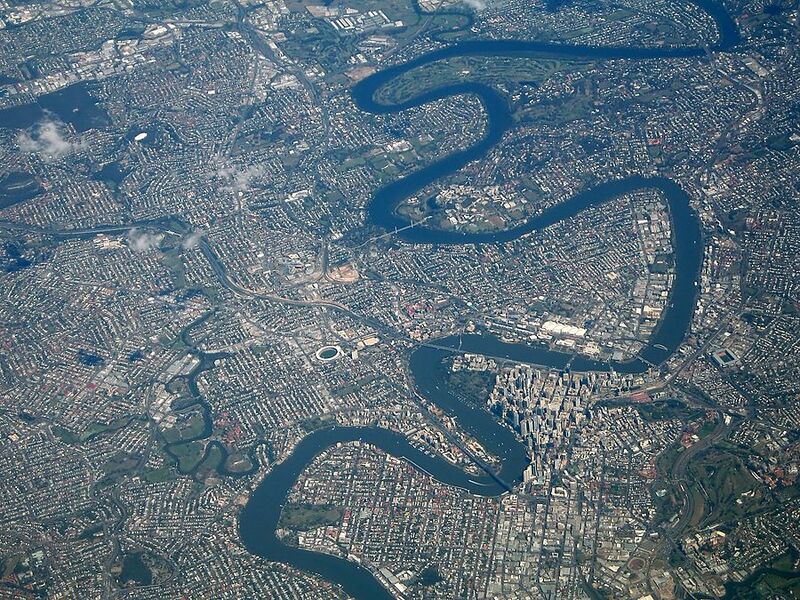 Like many western cities, Brisbane sprawls into the greater metropolitan area. This results from the fact that most of Brisbane's housing stock consists of detached houses. Early legislation decreed a minimum size for residential blocks causing few terrace houses being constructed in Brisbane. Recently the density of the city and inner city neighbourhoods has increased with the construction of apartments, with the result that the population of the central business district has doubled over the last 5 years. The high density housing that historically existed came in the form of miniature Queenslander-style houses which resemble the much larger traditional styles but are sometimes only one quarter the size. These miniature Queenslanders are becoming scarce but can still be seen in the inner city suburbs. Multi residence accommodations (such as apartment blocks) are relatively new to Brisbane, with few such blocks built before 1970, other than in inner suburbs such as New Farm. Pre-1950 housing was often built in a distinctive architectural style known as a Queenslander, featuring timber construction with large verandahs and high ceilings. The relatively low cost of timber in South-East Queensland meant that until recently most residences were constructed of timber, rather than brick or stone. Many of these houses are elevated on stumps (also called "stilts"), that were originally timber, but are now frequently replaced by steel or concrete. Brisbane is home to several of Australia's tallest buildings. Brisbane's tallest building is 1 William Street at 260 metres, to be overtaken by the 270 metre Brisbane Skytower which is currently under construction. Brisbane has a humid subtropical climate (Köppen climate classification: Cfa) with hot, humid summers and dry moderately warm winters. Due to its proximity to the Coral Sea and a warm ocean current, Brisbane's overall temperature variability is somewhat less than most other Australian capitals, particularly in winter, when maximum temperatures below 20 °C (68 °F) are relatively uncommon (compared with Sydney, Melbourne, Adelaide, and Perth). 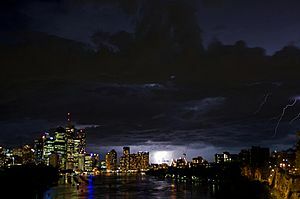 From November to March, thunderstorms are common over Brisbane, with the more severe events accompanied by large damaging hail stones, torrential rain and destructive winds. On an annual basis, Brisbane averages 124 clear days. Dewpoints in the summer average at around 20 °C (68.0 °F); the apparent temperature exceeds 30 °C (86.0 °F) on almost all summer days. The city's highest recorded temperature was 43.2 °C (110 °F) on 26 January 1940, but temperatures above 38 °C (100 °F) are uncommon. On 19 July 2007, Brisbane's temperature fell below the freezing point for the first time since records began, registering −0.1 °C (32 °F) at the airport station. The city station has never dropped below 2 °C (35.6 °F), with the average coldest night during winter being around 6 °C (42.8 °F), however locations directly west of Brisbane such as Ipswich have dropped as low as −5 °C (23 °F) with heavy ground frost. In 2009 Brisbane recorded its hottest winter day at 35.4 °C (96 °F) on 24 August. The average July day however is around 22 °C (72 °F) with sunny skies and low humidity, occasionally as high as 27 °C (81 °F), whilst maximum temperatures below 18 °C (64 °F) are usually associated with brief but not uncommon periods of cloud and winter rain. Brisbane's wettest day occurred on 21 January 1887, when 465 millimetres (18.3 in) of rain fell on the city, the highest maximum daily rainfall of Australia's capital cities. 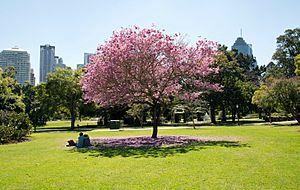 The highest minimum temperature ever recorded in Brisbane was 28.0 °C (82.4 °F) on 29 January 1940 and again on 21 January 2017, whilst the lowest maximum temperature was 10.2 °C (50.4 °F) on 12 August 1954. From 2001 until 2010, Brisbane and surrounding temperate areas had been experiencing the most severe drought in over a century, with dam levels dropping to 16.9% of their capacity on 10 August 2007. Residents were mandated by local laws to observe level 6 water restrictions on gardening and other outdoor water usage. Per capita water usage is below 140 litres per day, giving Brisbane one of the lowest per capita usages of water of any developed city in the world. On 9 January 2011, an upper low crossed north of Brisbane and dropped rainfall on an already saturated southeast coast of Queensland, resulting in severe flooding and damage in Brisbane and the surrounding area; the same storm season also caused the water storage to climb to over 98% of maximum capacity and broke the drought. Water restrictions have been replaced with water conservation measures that aim at a target of 200 litres per day/per person, but consumption is rarely over 160 litres. In November 2011, Brisbane saw 22 days with no recorded rainfall, which was the driest start to a November since 1919. Brisbane also lies in the Tropical Cyclone risk area, although cyclones are rare. The last to affect Brisbane but not directly cross the city was Tropical Cyclone Hamish in March 2009: it remained 350 km (220 mi) north of Brisbane but caused significant damage to beaches as well as an oil spill outside Moreton Bay. Average annual temperature of the sea is 24 °C (75 °F), from 21 °C (70 °F) in July to 27 °C (81 °F) in February. 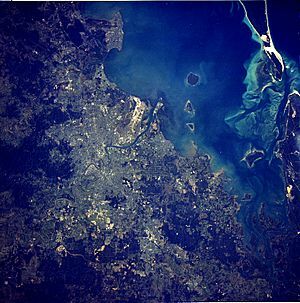 The city is susceptible to severe thunderstorms in the spring and summer months; on 16 November 2008 a severe storm caused tremendous damage in the outer suburbs, most notably The Gap. Roofs were torn off houses and hundreds of trees were felled. More recently, on 27 November 2014, a very strong storm made a direct hit on the city centre. Described as 'the worst storm in a decade,' very large hail smashed skyscraper windows while a flash flood tore through the CBD. Wind gusts of 141 km/h (88 mph) were recorded in some suburbs, many houses were severely damaged, cars were destroyed and planes were flipped at the Brisbane and Archerfield Airports. Dust storms in Brisbane are extremely rare; on 23 September 2009, however, a severe dust storm blanketed Brisbane, as well as other parts of eastern Australia. Brisbane's Greater Capital City Statistical Area includes the Local Government Areas of City of Brisbane, City of Ipswich, Moreton Bay Region, Logan City and Redland City, as well as parts of Lockyer Valley Region, Scenic Rim Region and Somerset Region, which form a continuous metropolitan area. The Australian Bureau of Statistics estimates that the population of Greater Brisbane is 2,274,600 as of June 2014. The 2011 census reported 2,065,996 residents within the Brisbane GCCSA, making it the third largest city in Australia. Brisbane recorded the second highest growth rate of all capital cities since the previous Census, growing by 11.5%. The 2011 census showed that 2% of Brisbane's population were of indigenous origin and 29.7% were born overseas. Of those born outside of Australia, the four most prevalent countries of birth were the United Kingdom, New Zealand, India, and Mainland China. About 17.9% of households spoke a language other than English, with the most common languages being Mandarin 1.5%, Vietnamese 0.9%, Cantonese 0.9%, Samoan 0.6% and Spanish 0.6%. The Queensland Gallery of Modern Art (GOMA), opened in December 2006, is one of the latest additions to the South Bank precinct and houses some of the most well-known pieces of modern art from within and outside Australia. GOMA is the largest modern art gallery in Australia. GOMA holds the Asia Pacific Triennial (APT) which focuses on contemporary art from the Asia and Pacific in a variety of media from painting to video work. In Addition, its size enables the gallery to exhibit particularly large shows — the Andy Warhol exhibition being the largest survey of his work in Australia. GOMA also boasts Australia's largest purpose-built Cinémathèque. 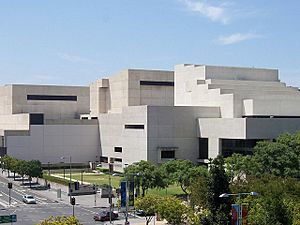 The Gallery of Modern Art is located next to the State Library of Queensland and the Queensland Art Gallery. 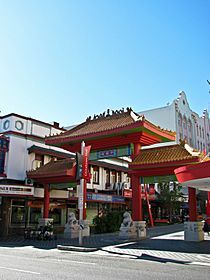 Along with Beijing, Berlin, Birmingham and Marseille, Brisbane was nominated as one of the Top 5 International Music Hotspots by Billboard in 2007. There are also popular entertainment pubs and clubs within both the City and Fortitude Valley. Brisbane has maintained a constantly evolving live music scene, producing acts spanning genres including punk (see Brisbane punk rock), indie rock, electronic music, experimental music, noise rock, metal and post-punk. Brisbane's live music history is often intertwined with social unrest and authoritarian politics, as retold by journalist Andrew Stafford in Pig City: From The Saints to Savage Garden, Radical Brisbane: An Unruly History, edited by academics Raymond Evans and Carole Ferrier, and BNE - The Definitive Archive: Brisbane Independent Electronic Music Production 1979-2014, produced by record label director Dennis Remmer. The Saints, based in Brisbane since 1974, were one of the first punk rock bands to form outside the United States. "Bris Vegas" is an ironic nickname given to the city. This has been attributed to an Elvis Presley tribute CD and the city's growing live music scene. 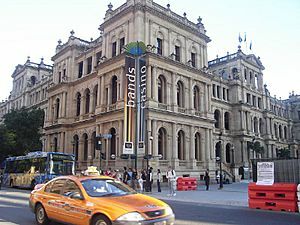 It is believed to have been first used in print in a 1996 edition of The Courier-Mail, also about the time of the opening of the Treasury Casino in Brisbane and the popularisation of poker machines in Brisbane bars and clubs, a play on the popular gaming ground of Las Vegas. The name has also been attributed to the city's nightlife, compact size of the central business district and perceived lack of sophistication, a comparison to the ostensibly kitsch and crass Las Vegas. Brisbane Facts for Kids. Kiddle Encyclopedia.